Mice can't swim. Well, maybe they just can't swim in chlorinated water. Just about every time I go out to skim the pool, I find some poor mouse floating face down. I think last week alone I pulled about five mice out of the water. It's a shame really. Preventable too I think, with the proper precautions in place. So I've hired a lifeguard to help alleviate the situation. She's a good swimmer, although I think she just really wants to work on her tan. But she's pretty friendly and she works for cheap. If only I could get her to shave her legs. Side note: Stiffy, pictured in the background, does shave her legs as far as I know. At least when she comes to the pool anyway. Awwwwwwwwwwww your lifeguard is adorable! Does she have to wear a "Little Swimmer's Pullups" ? You certainly don't have to set mouse traps as long as you have that pool! I hope Stiffy is wearing sunscreen! Lookin' cool by the pool. Thanks Lynt. Coco Channel always tries to look her best, even when sitting by the pool. She should be wearing them Ruybe Jean. She likes to watch more than she likes to swim however, so I don't think we have had any piddles in the pool. But hey, that's what chlorine is for :). Thanks Rita. Coco really does not like wearing those things, but I think they look smashing on her. All she needs is a drink with an umbrella Chewy and she would be all set. She's much more of a lady than the little one. That is hysterical. And, thanks on the birthday wishes. You're welcome Hahn. Hope your birthday was awesome! She's adorable. 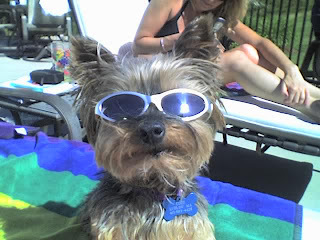 No way could I ever get shades on my pooches. Adorable. Just think Coco is a doll! I bet she does piddle a liddle down there!